A popular, reliable and secure aluminium entrance door. Available in a wide range of styles and formats, our stylish aluminium entrance door systems are suitable for both light and medium-duty use. Designed with security and flexibility in mind, every door in the range is available in single and double configurations making them ideal for almost any application. The ALUK 58BD entrance door is available in a wide range of styles and formats and is suitable for both light and medium-duty use. Designed with security specifically in mind, each of the doors in this range is available as a single or double configuration depending on your project needs. Using the natural strength of aluminium to provide larger expanses of glass and allowing in increased natural light, they are strong and secure with a full range of quality hardware. The high security multipoint hook locking ensures peace of mind when it comes to the protection of a property. These 58BD door system is the ideal choice for residential or commercial projects offering a cost-effective and high performance solution. With clean lines and advanced functionality, this door system offers flexibility and versatility. Created using durable and lightweight aluminium, the 58BD aluminium entrance door also has a cloaking feature to prevent unwanted access to locking points which further enhances the security. This door is the ultimate choice for the security conscious. You can take a look around our showroom using the virtual reality tour which gives you an insight into the samples and products we have on show. Take a look at our product videos and see for yourself how the intelligent design of the ALUK 58BD entrance door exudes a strong and durable design with pleasing aesthetic. There are a range of benefits when you select the ALUK 58BD entrance door range for your project. Designed to maximise home security, they feature multi-point locking systems as standard with security cylinders and a secure barrel hinge. Available in a wide range of styles, whether you’re looking for a contemporary aesthetic or something more classic or traditional, there is an aluminium door to match any property type whether residential or commercial. Each of our single or double doors are made to measure, to suit your project needs and to provide a durable and long-lasting product that can be enjoyed for years to come. Select the dimensions you require and enjoy a seamless integration. 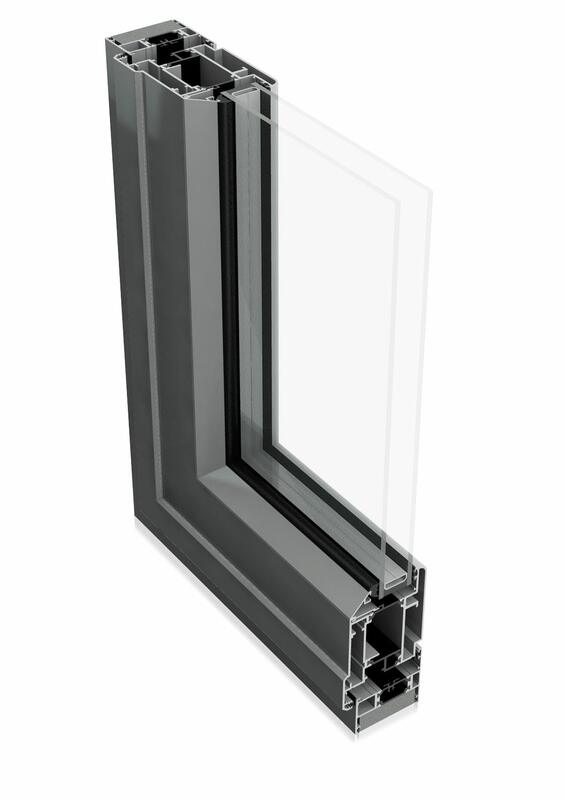 They meet all of the requirements for weather resistance, security, energy efficiency and home safety. You can select what opening configurations are needed, whether you want the door to open inward or outward depending on the space available. This gives you the flexibility to install the door into areas of a property or building that best suits the floor plan. Take a look at our product brochures below. Here you can find technical information and specifications to download for future use. When selecting entrance doors, it is important that they provide protection, insulation and stunning aesthetics. The ALUK 58BD entrance doors tick all of these boxes, making a welcome addition to any property type. There are no limitations when it comes to tailoring your entrance doors to your exact needs and requirements. Our entrance door range combines superior protection with a clean design, featuring a three chamber system that has been designed to offer the highest levels of performance. The system is PAS 24 tested and includes locking systems and a range of door furniture to create a unique door that is bespoke to your project. Offering slimmer sightlines and greater performance, the 58BD is renowned for its security features and pleasing design. The first impression of a property or building is the entrance door and with the ALUK 58BD you’ll make a statement. With the 58BD window range also available, you can pair your entrance door to match the style of your windows for a consistent look and feel that provides a high end and luxury aesthetic. With a range of choices and options to choose from you’re bound to find the perfect fit. You can contact us today for a free quote for your front door today. Whether you’re looking for the ALUK 58BD entrance door to be implemented into a residential or commercial project, we can assist. Simply visit our contact page and fill out our online contact form. A member of our expert team will be able to answer any questions you may have. We are happy to recommend or advise on the most suitable products for your needs and requirements. Why should I choose aluminium entrance doors? When it comes to security, durability and strength, aluminium entrance doors outclass traditional timber and uPVC. This is due to the material being incredibly lightweight as well as strong, resulting in a more flexible design. Our ALUK 58BD aluminium entrance door range not only offers a robust profile but they are also stunning in design and style. Our aluminium entrance door range is particularly secure featuring multipoint locking mechanisms and a strong, hardwearing profile. Tested to withstand the most common forms of attempted break in, they ensure to keep your home safe and secure. The ALUK 58BD entrance door range has been specifically designed with security in mind. Are aluminium doors thermally efficient? Our aluminium entrance door range offers excellent levels of thermal efficiency, conserving energy by keeping warm air inside rather than letting it escape into the atmosphere. This is particularly beneficial when it comes to lowering energy costs and contributing to a greener environment by reducing carbon emissions.